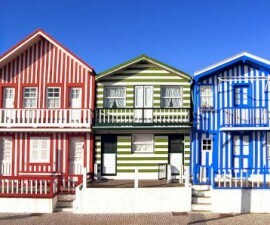 While city breaks may not always be the first choice for holidays with little ones in tow, there is plenty to do with children in Aveiro, Portugal. The city is perfectly suited for exploring on foot, with wide squares which are completely pedestrianised making the perfect playground for young and old alike. Relax and enjoy a coffee, cold beer or a glass of Port wine while you watch your children play freely in the green areas and parks scattered around town, safe in the knowledge that there is no traffic here to trouble them. The streets of Aveiro open out into the occasional green space or park, with play areas for children and plenty of room to sit down and relax in the sunshine. Enjoy a picnic under the shade of a eucalyptus as you listen to the birds tweeting and the sound of the water lapping gently at the edge of the canals. Not all exploration needs to be done on foot, either. 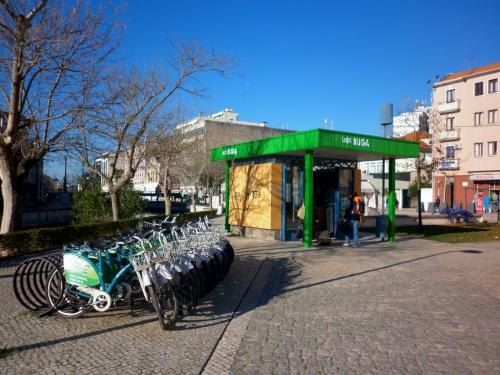 In fact, one of the most enjoyable activities with children in Aveiro is exploring the city by bike, thanks to the Bicicleta de Utilizaçao Gratuita de Aveiro project. This was set up a few years ago by the town hall to offer free bicycle hire for visitors to the city. The Bicicleta de Utilizaçao Gratuita de Aveiro project, known locally as BUGA, is situated just beyond the town hall, in the old quarter of town, and at one of the entrances of the shopping mall, Forum Aveiro. Locals and tourists, young and old, flock to the centre to borrow bikes on a daily basis, bringing the city to life with the sight of the distinctive green and white bikes down every street and path. Aveiro is criss-crossed by canals, each of which is accompanied by a pedestrian walkway, and these, too, are a delight to explore with the little ones. Exploring by bike is easy, as well as on foot, but there are other options too. The new craze for Segways has reached Aveiro, and older children as well as adults will enjoy joining a guided Segway tour for an experience to remember. Tours begin with a short training session to make sure everyone is comfortable with handling their Segway before setting out to discover the delights of Aveiro’s cobbled streets flanked by the lovely canals. Another way to explore the canals with children in Aveiro is to take a boat ride along the tranquil waters. The canal system is full of moliceiros, long, gondola-like boats which were originally designed for collecting seaweed for use as fertilizer in the outlying agricultural areas. These days, the moliceiros are more of a tourist attraction and manoeuvre their way through the waters from dawn until dusk, ferrying passengers between the most eye-catching and relevant sights in the city. The waters of the lagoon provide yet more opportunity for exploration. Larger ferry boats operate all day, taking passengers out into the lagoon and across to the beaches which line the outskirts of the city. Portugal is famed for its wide sandy beaches and these are no exception. Furthermore, unlike the sometimes busier tourist beaches of the south, they are often extremely quiet, even in the height of summer. There are several beaches within reach of the city, including Costa Nova, the long sand spit that runs north-south along the Atlantic coastline, Barra, which adjoins Costa Nova, and Sao Jacinto and its well-known natural park. Beach activities with children here include exploring the sand dunes, trying their hand at water sports such as kayaking, windsurfing, surfing and kite surfing, and following the nature trails of the Sao Jacinto natural park. 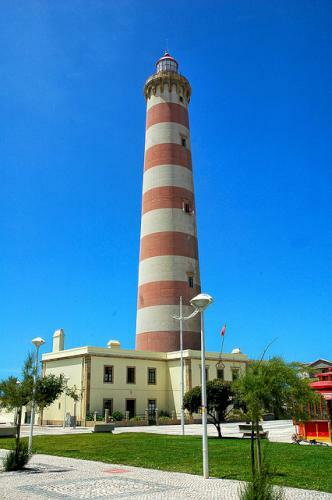 Don’t miss the lighthouse at Barra, whose grounds are open for visitors all year round and which can also be visited inside by prior arrangement. 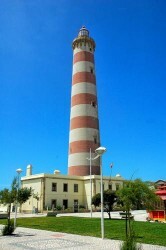 The lighthouse at Barra is the tallest in Portugal and the nineteenth tallest in the world. 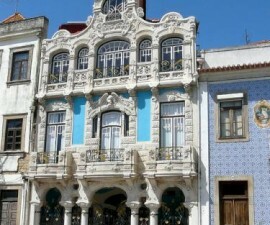 Aveiro riding school is another popular destination for families staying with children in Aveiro. Located just a short way out of the city, it offers plenty to keep the little ones amused. Riding lessons are available for children from age five right up to adult, and are suitable for beginners and experienced riders alike. If riding doesn’t appeal, there is plenty to do here besides this. 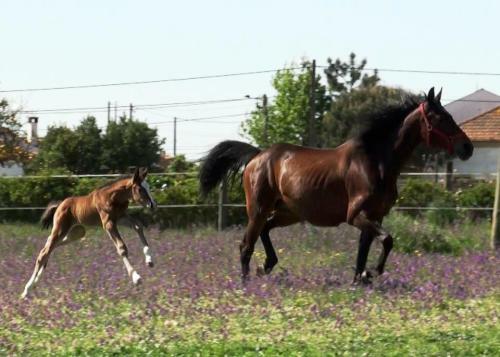 Aveiro riding school is adjacent to an educational farm, where children can meet and feed the animals and learn about them in their natural environment. This is the perfect place for a picnic amongst the greenery. The more adventurous can even try their hand at the high rope obstacle course on site.